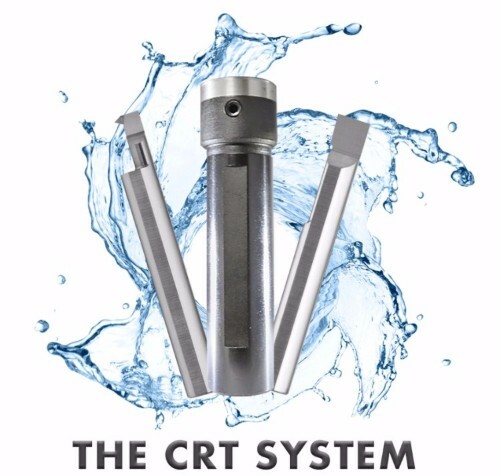 The CRT Qualified System – Scientific Cutting Tools, Inc.
SCT offers two holders with backstops: the CRT and the QHC. Our QHC holder has an infinitely adjustable backstop and is offered in both inch and metric specifications. The QHC is an economical option that has coolant holes that can be interfaced with your existing coolant through system. However, one cannot use the QHC backstop and interface at the same time. The CRT is coolant through even with the backstop in use and is also infinitely adjustable and available in both inch and metric specifications. Our premium holder, the CRT, offers 360 degrees of coolant through penetration. Using Coolant Ring Technology (CRT), it is designed to create a ring of coolant around the tool. Coolant surrounds the circumference of the tool, enabling coolant to find the path of least resistance and access the bottom of the bore. Use the CRT holder in conjunction with our qualified boring bars and/or qualified threading tools for quick change machining at optimal performance levels. Our BQ series of qualified boring bars offers dozens of sizes with overall length tolerances of ± 0.001 inch and overall diameter tolerances of ± 0.0005 inch. SCT also offers a line of qualified threading tools, completing our qualified system. Our TTQ threading tools are useful for internal lathe threading applications and have an overall length tolerance of ± 0.001 inch.